Japan Air Lines Flight 1628 was near the end of the Iceland-to-Anchorage leg of its flight from Paris to Tokyo with a cargo of wine, when its flight crew saw and tracked three unidentified objects. On the night of November 17, 1986, the sighting of at least one of the UFOs was initially confirmed by FAA and U.S. military ground radar. According to Captain Kenju Terauchi, First Officer Takanori Tamefuji and Flight Engineer Yoshio Tsukuda, two small lights and one huge lighted object were in sight on their radar for more than a half hour. They watched as they flew 350 miles (550 km.) southward across Alaska from Ft. Yukon toward Anchorage. 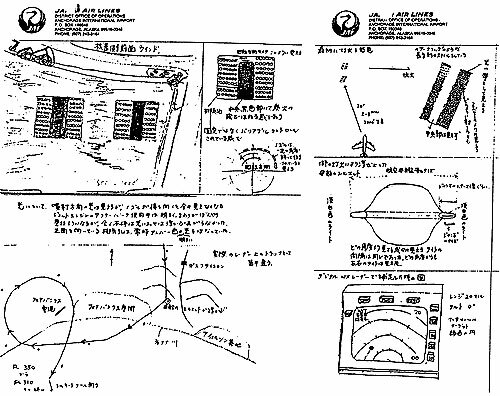 Drawings by Captain Terauchi and the crew of JAL flight 1628 of the UFOs they observed over Alaska in November 1986. Courtesy of FAA. Captain Terauchi, a veteran of 29 years flying, said "It was a very big one--two times bigger than an aircraft carrier." (see drawing above) He changed altitude and made turns, with FAA permission, in an effort to identify the objects which continued to follow him. He said the objects moved quickly and stopped suddenly. At one time, the light from the large object was so bright that it lit the airplane's cockpit and Captain Terauchi said he could feel heat from it on his face. He added that he had been watching the UFO for six minutes before notifying anyone on the ground; this would make the start of the sighting about 6:13 p.m.
"6:19 p.m. local time - The pilot of JL1628 requested traffic information from the ZAN (FAA Air Route Traffic Control Center, Anchorage) Sector 15 controller. "6:26 p.m. - ZAN contacted the Military Regional Operations Control Center (ROCC), and asked if they were receiving any radar returns near the position of JL1628. The ROCC advised that they were receiving a primary radar return in JL1628's 10 o'clock (left-front) position at 8 miles [13 km.]. "6:27 p.m. - The ROCC contacted ZAN to advise they were no longer receiving any radar returns in the vicinity of JL1628. "6:31 p.m. - JL1628 advised that the 'plane' was 'quite big,' at which time the ZAN controller approved any course deviations needed to avoid the traffic. "6:35 p.m. - JL1628 requested and received a heading change to two one zero (210 degrees, or southwest). The aircraft was now in the vicinity of Fairbanks and ZAN contacted Fairbanks Approach Control asking if they had any radar returns near JL1628's position. The Fairbanks Controller advised they did not. "6:36 p.m. - JL1628 was issued a 360 degree turn and asked to inform ZAN if the traffic stayed with them. "6:38 p.m. - The ROCC called ZAN advising they had confirmed a 'flight of two' in JL1628's position. They advised they had some 'other equipment watching this,' and one was a primary target only. "6:39 p.m. - JL1628 told ZAN they no longer had the traffic in sight. "6:42 p.m. - The ROCC advised it looked as though the traffic had dropped back and to the right of JL1628, however, they were no longer tracking it. "6:44 pm.. - JL1628 advised the traffic was now at 9 o'clock (left). "6:45 p.m. - ZAN issued a 10 degree turn to a northbound United Airlines flight, after pilot concurrence, in an attempt to confirm the traffic. "6:48 p.m. - JL1628 told ZAN the traffic was now at 7 o'clock (left rear), 8 miles [13 km.]. "6:50 p.m. - The northbound United flight advised they had the Japan Airlines flight in sight, against a light background, and could not see any other traffic. The third phase occurred as the "ships" receded and could only be seen as "two dim, pale, white lights," but an echo was picked up by the aircraft on-board radar. While Maccabee concedes that the echo could have been caused by "a temporary (self-repairing) failure" (as suggested by the FAA), he added that "it seems much more likely that there was some object out there." "It seems at least plausible that he may have misinterpreted oddly lighted clouds which the crew had reported to be below the aircraft. Although the several ground radar returns behind the jet were intriguing, the failure of the radar to show a continuous track of some unknown primary target makes the radar confirmation ambiguous at best. Therefore it seems that, at the very least, the last portion of the sighting is not so convincing as the earlier portions. 119. Federal Aviation Administration (FAA) report, December 29, 1986. 120. Federal Aviation Administration (FAA), "Chronological Summary of the Alleged Aircraft Sightings by Japan Airlines Flight 1628, January 6, 1987. 121. Statement by FAA Regional Director, Paul Steucke, at March 5, 1987, press conference in Anchorage, Alaska. See Anchorage Daily News, March 6, 1987. 122. Maccabee, Bruce, "The Fantastic Flight of JAL1628", International UFO Reporter, Vol. 12, No. 2, CUFOS, March/April 1987.